A fairy-tale prince isn’t necessary to break the spell of good ciabatta bread. This widely popular loaf means “slipper” in Italian due to its long, slender shape. A thin, crisp crust and a chewy, open crumb will have this bread gone by midnight. A sponge is nothing more than a yeasted pre-ferment; the same as the levain in naturally yeasted bread. At least 8 hours before you mix the dough (preferably overnight), combine the flour, yeast, and water for the sponge. Cover tightly and let rise. The sponge will at first be the consistency of a thick paste, but will bubble-up as it rises. For the dough, combine the flour through the milk, along with the entire sponge, in a medium bowl. Mix until dough is smooth. It will be very sticky. With a wet hand, fold the dough twice (a total of 8 turns). Cover with a kitchen towel and turn twice every 20 minutes for two hours. The dough will still be very sticky, bubbly, and doubled in size. Preheat oven to 450 degrees. Place a baking stone and two metal mixing bowls on the bottom rack of the oven 1 hour before you bake, just like you would for the sourdough breads. Liberally sprinkle your work surface with flour. Cut two 6×12 pieces of parchment paper and flour them. Get a dough scraper wet and turn out dough onto floured surface. Liberally flour the top of the dough. Cut the dough into two even pieces. 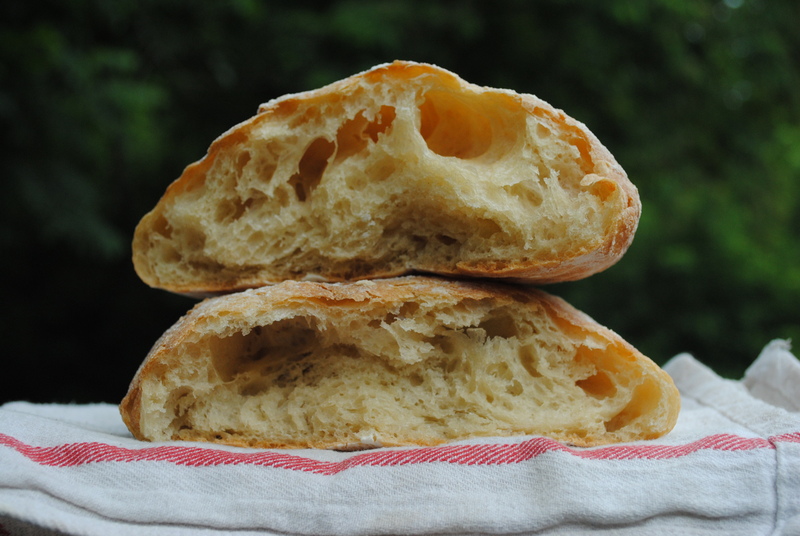 Ciabatta bread is usually folded and pulled into a long, slender shape. For a better crust, I wanted to bake these loaves in the same manner as the sourdough breads, under the hot mixing bowls. So to make it fit, I shaped the bread into squares. This is the same technique as the pre-shaping for sourdough loaves. With floured hands, pull the dough into a long, vertical rectangle. Fold the bottom up 2/3 of the way. Next, pull the sides out as far as they will go without tearing, and fold those over the folded-up bottom. Last, pull the top as far as it will go without tearing and pull down over the other folds. You should have a nice, neat envelope of dough. Transfer loaves, seam side down, to the floured parchment paper. Gently coerce dough into square-ish shapes and flour the tops. Cover with a kitchen towel and let rise 30 minutes. There is no need to score ciabatta bread. When ready to load the bread, take out the metal mixing bowls from the oven, transfer the loaves (parchment and all) to the baking stone, cover dough with the mixing bowls and bake for 13 minutes. After 13 minutes, remove bowls and continue to bake dough for another 10-13 minutes. Bread should be an attractive golden brown and cracked in places. Remove bread to cooling rack and let sit for an hour before slicing. Ciabatta bread has any number of uses. I think I’ll use mine to dip up mussels and broth.